Cemeteries in Sampson County have been surveyed seeking ancestors. In search of the McLamb Colored Cemetery continues as I find more and more people with this cemetery listed as the place of burial on their death certificate. Update: After seeing the name Eli Faircloth as being buried in the Melvin Cemetery, I realized that this was actually the McLamb Colored Cemetery. I visited this cemetery on February 8, 2015 and found other headstones of people that are identified as being buried in the McLamb Colored Cemetery and not the Melvin Cemetery. It appears that the cemetery name was used interchangeably. The cemetery is on land owned by the white McLambs. Update: On January 21, 2012 another attempt was made to find the McLamb Colored Cemetery in the rain. We were told that the cemetery was on Hobbs Road off of Fleet Cooper Road. Unfortunately, it was not the cemetery; therefore, the in search of the McLamb Colored cemetery continues. 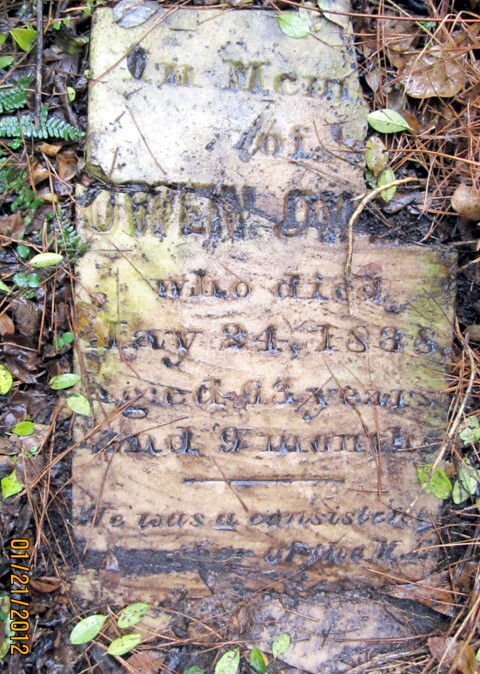 I did find this interesting gravemarker for an Owen Owen, Sr. a white slave owner in Sampson County. It showed he died May 24, 1838. Another stone was found with the name of Martha. With rain coming down it was hard to get good pictures of these markers are time to look for more. You know what that means...another trip. On February 28, 2015, the funeral services for Cousin Marilyn McLamb was held at Cedar Fall Missionary Baptist Church in Blenheim, South Carolina. The cemetery was hugs or should I say there were several cemeteries from the past to the present. And of course, I couldn't resist and had to take a quick stroll in all of hem. After observing a genealogist from Johnston County on April 18, 2012 demonstrate how to find unmarked graves and unreadable headstones, I finally created by cemetery toolkit. I used one of the tools to discover an inscription on this piece of stone at Point Level Church Cemetery on May 13, 2012. It is hard to believe I missed this. No one has ever mention in the family regarding this stone or whose grave it is. McLamb is clearly carved in this stone. On December 29, 2011, my great nephew Ron brave the over grown thick brush that consisted of vines and briars to get me a picture of a lone tombstone in what use to be called Hobbs Church Cemetery. The church is now called Union Grove and is on Keener Road in Sampson County where it intersect with Ashford Road. After all the trouble I put my great nephew through, the headstone did not confirm the cemetery was Hobbs Cemetery. He was a real trooper! Poor fellow got one foot caught up in the vines. I thought I was going to have to go in after him there for a moment. I instead held limbs out of his way. He was dressed appropriate for this outing. Once I got the year this person died, I was able to find the death certificate. Burial was at Union Grove, but according to the many elders in the community this church was once called Hobbs Church.